It's wedding season. Our newsfeeds are flooded with images of pretty dresses, flowers, cakes, and love. Pinterest is put to shame by the creativity of brides these days. We will celebrate our sixteenth wedding anniversary this year. My bridesmaids' dresses were periwinkle (God bless those girls) and I had never heard of Pinterest. We had no earthly idea the pound sign on our fancy cordless phones would become a hashtag, essential for every cool wedding. The ice sculpture my mama splurged for and the risqué rose petals our wedding planner sneaked into a travel bag for the honeymoon suite were as cutting edge as anything I'd ever seen. So much has changed, but the key details have remained. 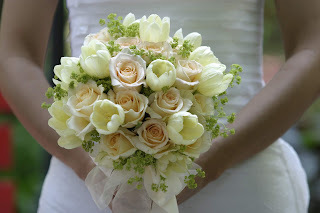 The bride must be exquisite, the venue handpicked, and the groom's anticipation visible to all. My best friend and I still laugh about all the nights she tried to fall asleep with her dark curls sprawled across her pillow and my long straight dirty blond ones on mine, except I wouldn't stop talking and nudging her. I would sketch out my dream wedding dress for the millionth time (and the good Lord knows I cannot sketch anything) and prod her to tell me how perfect it was. I was fixated on the fairytale of marriage for as long as I can remember. By the time I was standing behind those closed double doors on my daddy's arm with a veil over my face, I honestly could not contain myself. I remember him gently scolding me for acting a fool, never one to want to make waves or cause a ruckus. I couldn't help it. It was too much. I was head over heels for that handsome fellow waiting with his dark sideburns and grin that made his eyes disappear. I had been preparing for that moment all my life and I just knew it was going to be worth it all when I saw his face. Surely, no love had ever compared. As it turns out, the church we got married in didn't have a center aisle, so I am really not sure when he first caught a glimpse of me. I was crying until I couldn't see behind a veil that was sticking to my face because it was hotter than words in there. (My precious groom had been given the choice between air conditioning and candelabras that stayed lit. Knowing better than to mess with my decorations, the air was cut off. He had no idea I had an hour long festivity planned for all of us and his decision might cost us our very lives in that miserable midsummer heat.) I do remember grinning through my tears and trying my best to get him to quit telling me silly things under his breath to make me laugh all throughout the service. My heart overflowed with joy, anticipation, excitement, gratitude... all the feels the whole way through our wedding. We had arrived. All else were mere details when we were on the cusp of happily ever after. I like to think Jesus loved a good wedding, too. When his mother nudged him to help when they ran out of wine at a wedding, I love his response. "Woman, what does this have to do with me? My hour has not yet come." - John 2:4 (If I didn't know better, I'd detect a hint of sass in there and I love it.) But we all know He went on to perform his first miracle there, turning ordinary water into wine in their time of need. The details - and the refreshments - matter, people. In Mark 2, when questioned why the disciples of Jesus did not fast, Jesus said, "Can the wedding guests fast while the bridegroom is with them? As long as they have the bridegroom with them, they cannot fast. The days will come when the bridegroom is taken away from them, and then they will fast in that day." He was their portion and their prize. They had no reason to fast when Christ was among them, but He spoke of the day that was coming when that would change. "I wish you would bear with me in a little foolishness. Do bear with me! For I feel a divine jealousy for you, since I betrothed you to one husband, to present you as a pure virgin to Christ. But I am afraid as the serpent deceived Eve by his cunning, your thoughts will be led astray from a sincere and pure devotion to Christ." Paul plead with the people at Corinth to bear with him, to recognize false apostles, and to stand firm that they would not be led away from a pure devotion to Christ, to whom they would be betrothed in the end. All throughout Scripture, Christ is referred to as the Bridegroom and the church as His bride. For this fairytale-loving girl, there could not be a better illustration of what is to come. It's been a long time, but nothing will ever make me forget the intentionality put forth in selecting the dress that made everyone in the three-way mirror cry, the cake that was the perfect combination of delicious and beautiful, the little bells with personalized ribbons in a basket by the guestbook: it all had to be perfect. Hours upon hours turned into months upon months leading up to that single event. It was a labor of love: preparing to meet my groom at the altar. 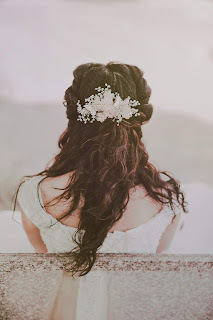 What happens when it seems our bridegroom is delayed? If I had to wait forever for Matt, I believe I would have. If I had to spend years upon years making the arrangements, but had the promise the day of our union was coming, I'd have held on. That's what love does. He will make us exquisite if we'll let Him, but we are free to fill this time any which way we choose. Make no mistake though, the Bridegroom IS coming. Surely, He is coming soon. We'd be so foolish to not get ready while we can. So much changes while we wait, but the key details remain. Standing down here with this veil over my face, I can hardly contain myself. I've been raised better than to act a fool; I'm almost never one to want to make waves or cause a ruckus. But when it comes to this Bridegroom, y'all, I can't help it. He's too much. If you only knew the love He's shown, the painstaking measures He's gone to in order to remove all the ugly stains in my life so that I can be presented to Him in splendor... to make a filthy wretch into an exquisite bride. You wouldn't believe it if I told you. I'm head over heels for this One who loves me without hesitation or limit, who fiercely protects me, and gently guides me toward that Day. No love could compare in all the earth. I've been longing for this union all my life. I just know it's going to be worth it ALL when I see His face.